Think this is a normal pie? Clearly you forgot that I'm a small person with tiny bakeware and a taste for the slightly unusual. Some people (like, oh, the National Pie Council, whoever THEY are) say Pie Day is in January, but 3/14 is easier to remember than some arbitrary date in the stupidest month of the year. So I’m celebrating today. Actually, I forgot about Pi Day until last night, but luckily I made up these tartlets yesterday! They’re itty bitty little guys, baked in mini tart pans (two were baked in shallow oval ramekins so they’re slightly larger…and oblong-ier). This was my first time blind-baking crust and it turned out great. I was a little concerned because the recipe I used for the crust was weird – it called for only one egg to hold together nearly four cups of dry ingredients. When I added the egg, it was like I hadn’t added it at all, so I threw another one in and it came together immediately. Maybe the first one was a phantom egg or something. Can you tell I'm into sunny food lately? Oh god I'm so pasty. Oh, right, you’re probably wondering what that is. It’s a passionfruit-strawberry curd tart with sweet almond crust, orange blossom chantilly cream and a little bit of candied kumquat on top. Yumsters! The curd was originally meant to be just passionfruit, but one of the two passionfruits I bought wasn’t really ripe enough yet (those guys are tricky!) and when I was blendering it up with a bit of water I, uh, forgot to check if the blender was screwed together tightly. When I lifted the container part to pour the juice through the strainer, juice leaked EVERYWHERE. Luckily, I obsessively disinfect the counters so was able to save some that spilled out, and made up the difference in strawberry juice, which I squeezed from strawberry puree via some cheesecloth. It turned a beautiful sunset color, which was lost to the overbearing yellow of the egg yolks in the curd. So I did add a little red food coloring to the curd to recapture the orange-osity. 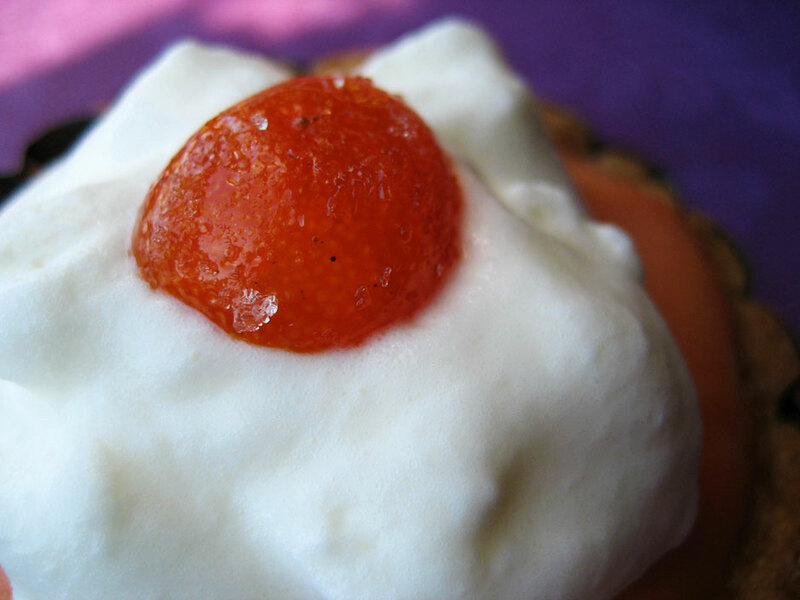 Any dessert is better with whipped cream and a cherry - or candied kumquat! - on top. Since I was only making a few little tartlets, I ended up with a ton of extra dough, so there will be more tarts and pies in my future! Hooray! Special thanks to Carrie for lending me her copy of The Secrets of Baking, which is where I got the pie dough recipe. This book is really fantastic and I’m reading it cover to cover! I'm gonna eat the HECK out of this guy after dinner. Whisk together the eggs, yolks and salt. Combine the juice and sugar in a saucepan, stir and heat until almost boiling. Whisk the juice mixture into the egg mixture and pour back into the saucepan. Place the pan over medium heat, whisking constantly until it thickens. Once thick, immediately strain (use a nice finely-meshed strainer) into a bowl and stir in the butter until it’s completely melted. Cover with plastic wrap, pressing it down onto the surface of the curd so a skin doesn’t form. Poke a few tiny holes in the plastic to allow steam to escape and refrigerate overnight. Place the pieces of butter in the freezer to chill for 15 minutes. In the meantime, sift together the sugar and flours into the bowl of a stand mixer. Add the butter and mix on low speed with the paddle attachment for 2 minutes (the original recipe says the butter should be the size of broken walnut meats, which is a bit arbitrary…a little bigger than pea-sized is probably a better description). If there are any super-duper huge pieces of butter left, pinch them flat between your fingers (turn the mixer off first, of course). Combine the eggs and salt in a small bowl and whisk until the egg is evenly beaten and the salt dissolves. With the mixer on low, add the egg all at once. The dough will come together within a few seconds. Don’t mix any more than you have to – just until it’s a cohesive dough with no extra wet eggy streaks. Remove the dough from the bowl and wrap it in plastic, then chill for at least an hour in the fridge. When you are ready to bake the tart shells, remove the dough from the fridge. Preheat the oven to 350 and place your oven rack in the bottom third of the oven. If you’re using a regular-sized pie plate or tart pan, divide the dough in half and refrigerate or freeze the other half for later use (up to 3 days in fridge or 3 weeks in freezer). Use smaller bits at a time for smaller pans and freeze or refrigerate any leftover dough. Roll out on a lightly floured, clean surface with a floured pastry roller and press into pan (the dough is crumbly so don’t worry if you have to patch it together). Prick the bottom a few times with a fork and prepare for blind baking. I cut out shapes of parchment paper to match the pans (circles for the tart pans and ovals for the ramekins), set them in the pans and added rice to weigh them down. You can use dried beans or pie weights or whatever. 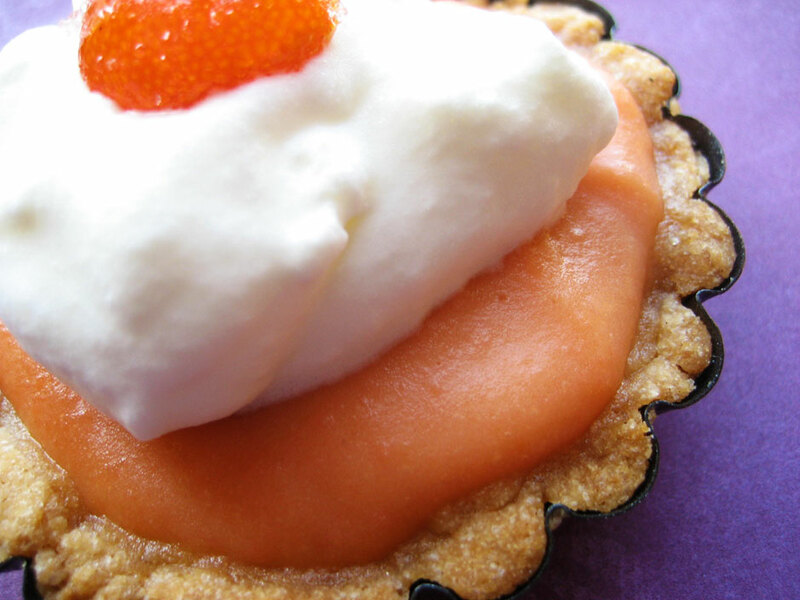 Place in oven and bake 10 minutes for a regular-sized tart, 7-8 minutes for a bunch of mini ones. Turn the heat down to 325 and bake another 10/7-8 minutes. Remove the “fillings” and bake a few minutes more, until the crusts are golden brown. Allow to cool fully on a rack before using. Spoon the curd into the cooled tart shells and chill – in this case a skin forming on the curd is fine, it won’t affect the flavor and will help keep the curd in place. To make the chantilly cream, whip some whipping cream to soft peaks in a stand mixer, add sugar and flavorings and whip to stiff peaks, then spoon onto the curd. Use a ratio of 2 Tbsp sugar for every cup of cream, and add just a bit (less than half a teaspoon) of orange blossom water. Top with the end of a candied kumquat, or some other bit of candied citrusy fruit. If you’ve never made passionfruit juice before, it’s easy! Pick a nice, wrinkly passionfruit (they wrinkle as they ripen – the ones that are all smooth and pretty are underripe and won’t be juicy). Cut it in half and scoop the orange pulpy middle, seeds and all, into a blender. Make sure your blender is screwed together tightly! Add some fresh water (not a lot, I added maybe 1/2 cup) and blend briefly. Pour through a finely-meshed strainer into a measuring cup. If you need slightly more juice, you can add a bit more water or make it up with the fresh-squeezed juice of another fruit. Strawberry is what I chose, but you could use any citrus or berry juice. Orange or raspberry would probably both be very nice. 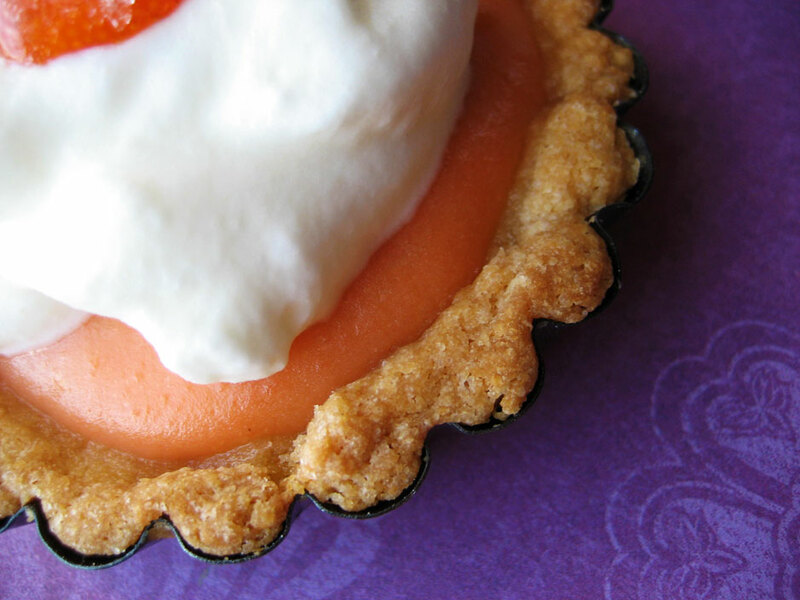 oh these lil’ tarts are so cute! The filling is so creative as well. Mmmm–lovely! I love passionfruit curd–so tangy and crazy:) We used to make a wonderful passionfruit semifreddo w/passion curd, passionfruit Italian meringue and whipped cream all folded together. Ridiculous! Ah, I totally missed Pi Day! 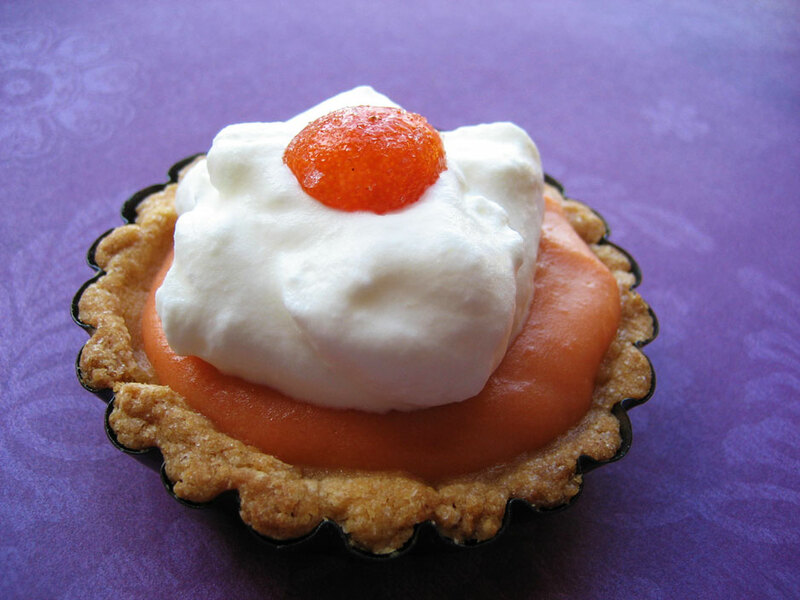 What a cute tart – I love how you adapted it according to circumstances. The kumquat on the top is the crowning glory. These are so pretty and dainty. If I ever had high-tea at my house, these would be front and center. Oh my gosh! I love passion fruit…this tart looks so yummie. Thanks!